, an eminent English divine, was born at Stow Qui in Cambridgeshire, Sept. 23, 1650. His father Jeremy Collier was a divine and a considerable linguist; and some time master of the free-school at Ipswich, in Suffolk. He was educated under his father at Ipswich, whence he was sent to Cambridge, and admitted a poor scholar of Caius college under the tuition of John Ellys, in April 1669. He took the degree of B. A. in 1673, and that of M. A. in 1676; being ordained deacon the same year by Gunning, bishop of Ely, and priest the year after by Compton bishop of London. He officiated for some time at the countess dowager of Dorset’s at Knowle in Kent, whence he removed to a small rectory at Ampton near St. Edmund’s Bury in Suffolk, to which he was presented by James Calthorpe, esq. in 1679. After he had held this benefice six years, he resigned it, came to London in 1685, and was some little time after made lecturer of Gray’s Inn. But the revolution coming on, the public exercise of his function became impracticable. 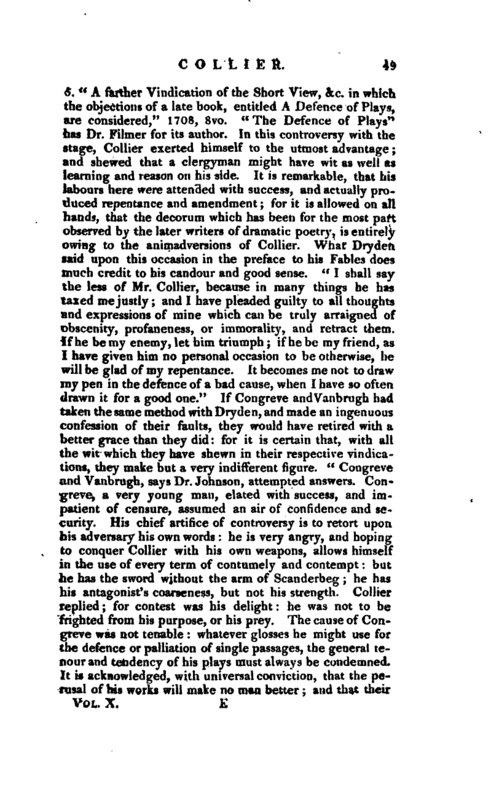 Collier, however, was of too active a spirit to remain supine, and therefore began the attack upon the revolution: for his pamphlet is said to have been the first written on that side the question after the prince of Orange’s arrival, with a piece entitled “The Desertion discussed in a letter to a country gentleman, 1688,” 4to. 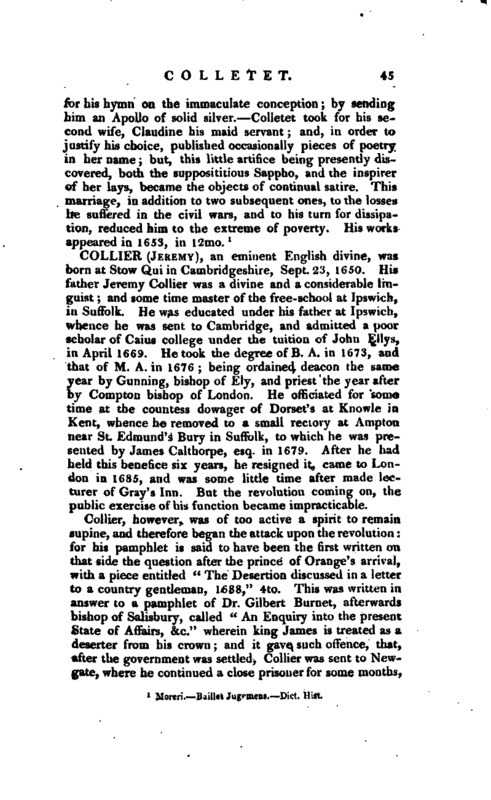 This was written in, answer to a pamphlet of Dr. Gilbert Burnet, afterwards bishop of Salisbury, called “An Enquiry into the present State of Affairs, &c.” wherein king James is treated as a deserter from his crown; and it gave such offence, that, after the government was settled, Collier was sent to Newgate, where he continued a close prisoner for some months, | but was at length discharged without being brought to a trial. He afterwards published the following pieces: 1. A translation of the 9th, 10th, llth, and 12th books of Sleidan’s Commentaries, 1689, 4to. 2. “Vindiciae juris regii, or remarks upon a paper entitled An Enquiry into the measures of submission to the Supreme Authority,” 1689, 4to. The author of this inquiry was also Dr. Burnet. 3. “Animadversions upon the modern explanation of 2 Hen. VII. chap. i. or a king de facto,” 1689, 4to. 4. “A Caution against Inconsistency, or the connection between praying and swearing, in relation to the Civil Powers,” 1690, 4to. This discourse is a dissuasive from joining in public assemblies. 5. “A Dialogue concerning the Times, between Philobelgus and Sempronius, 1690, 4to: to the right honourable the lords, and to the gentlemen convened at Westminster, Oct. 1690.” This is a petition for an inquiry into the birth of the prince of Wales, and printed upon a half sheet. 6. “Dr. Sherlock’s Case of Allegiance considered, with some remarks upon his Vindication,” 1691, 4to. 7. “A brief essay concerning the independency of Church Power,” 1692, 4to. 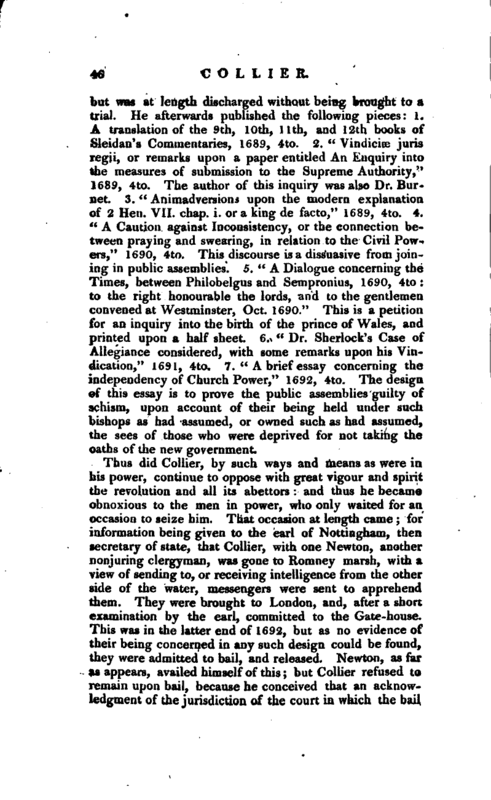 The design of this essay is to prove the public assemblies guilty of schism, upon account of their being held under such bishops as had assumed, or owned such as had assumed, the sees of those who were deprived for not taking the oaths of the new government. Thus did Collier, by such ways and means as were in his power, continue to oppose with great vigour and spirit the revolution and all its abettors: and thus he became obnoxious to the men in power, who only waited for an occasion to seize him. That occasion at length came; for information being given to the earl of Nottingham, then secretary of state, that Collier, with one Newton, another nonjuring clergyman, was gone to Romney marsh, with a view of sending to, or receiving intelligence from the other side of the water, messengers were sent to apprehend them. They were brought to London, and, after a short examination by the earl, committed to the Gate-house. This was in the latter end of 1692, but as no evidence of their being concerned in any such design could be found, they were admitted to bail, and released. Newton, as far as appears, availed himself of this but Collier refused to remain upon bail, because he conceived that an acknowledgment of the jurisdiction of the court in which the bail | was taken, and consequently of the power from whence the authority of the court was derived, and therefore surrendered in discharge of his bail before chief justice Holt, and was committed to “the king’s-bench prison. 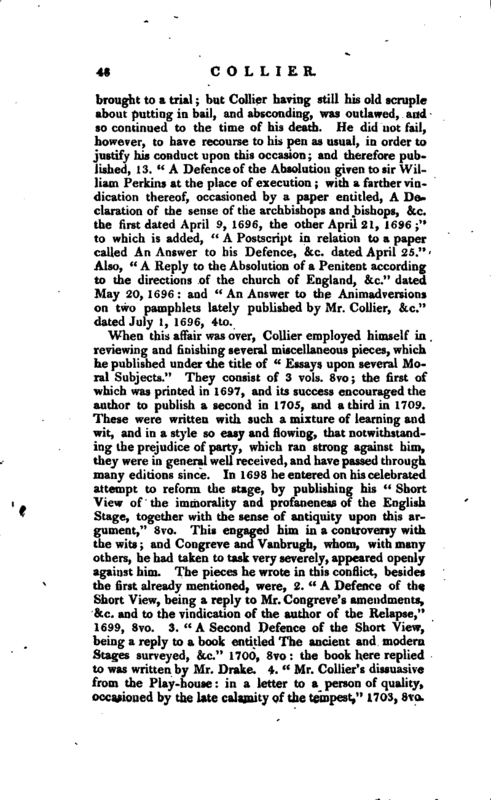 He v/as released again at the intercession of friends, in a very few days; but still attempted to support his principles and justify his conduct by the following pieces, of which, it is said, there were only five copies printed: 8.” The case of giving Bail to a pretended authority examined, dated from the King’s-bench, Nov. 23, 1692,“with a preface, dated Dec. 1692; and, 9,” A Letter to sir John Holt,“dated Nov. 30, 1692; and also, 10.” A Reply to some Remarks upon the case of giving bail, &c. dated April, 1693.“He wrote soon after this, 11.” A Persuasive to consideration, tendered to the Royalists, particularly those of the Church of England,“1693, 4to. It was afterwards reprinted in 8vo, together with his vindication of it, against a piece entitled” The Layman’s Apology.“He wrote also, 12.” Remarks upon the London Gazette, relating to the Streights’ Fleet, and the Battle of Landen in Flanders," 1693, 4to. We hear no more of Collier till 1696; and then we find him acting a very extraordinary part, in regard to sir John Friend and sir William Perkins, who were convicted of being concerned in the assassination plot. 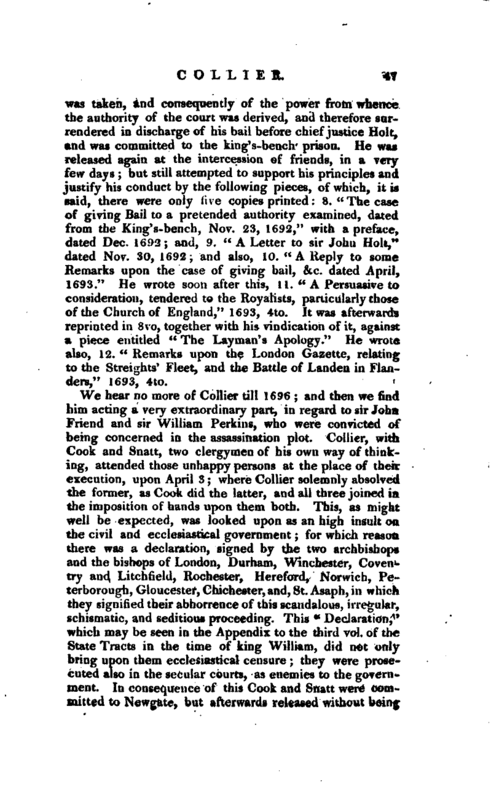 Collier, with Cook and Snatt, two clergymen of his own way of thinking, attended those unhappy persons at the place of their execution, upon April 3; where Collier solemnly absolved the former, as Cook did the latter, and all three joined in the imposition of hands upon them both. This, as might well be expected, was looked upon as an high insult on the civil and ecclesiastical government; for which reason there was a declaration, signed by the two archbishops and the bishops of London, Durham, Winchester, Coven<­try and Litchfield, Rochester, Hereford, Norwich, Peterborough, Gloucester, Chichester, and, St. Asaph, in which they signified their abhorrence of this scandalous, irregular, schismatic, and seditious proceeding. This “Declaration,” which may be seen in the Appendix to the third vol. of the State Tracts in the time of king William, did not only bring upon them ecclesiastical censure; they were prosecuted also in the secular courts, as enemies to the government. In consequence of this Cook and Snatt were committed to Newgate, but afterwards released without being | brought to a trial; but Collier having still his old scruple about putting in bail, and absconding, was outlawed, and so continued to the time of his death. He did not fail, however, to have recourse to his pen as usual, in order to justify his conduct upon this occasion; and therefore pubJished, 13. “A Defence of the Absolution given to sir William Perkins at the place of execution; with a farther vindication thereof, occasioned by a paper entitled, A Declaration of the sense of the archbishops and bishops, &c. the first dated April 9, 1696, the other April 21, 1696;” to which is added, “A Postscript in relation to a paper called An Answer to his Defence, &c. dated April 25.” Also, “A Reply to the Absolution of a Penitent according to the directions of the church of England, &c.” dated May 20, 1696: and “An Answer to the Animadversions on two pamphlets lately published by Mr. Collier, &c.” dated July 1, 1696, 4to. 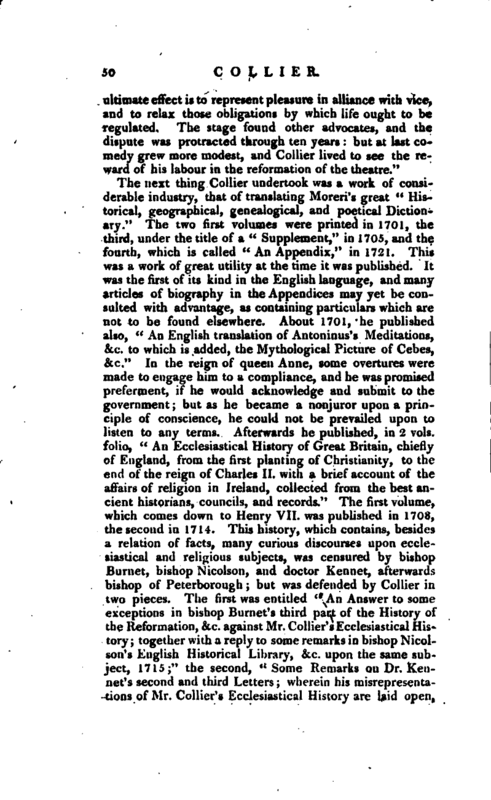 The next thing Collier undertook was a work of considerable industry, that of translating Moreri’s great “Historical, geographical, genealogical, and poetical Dictionary.” The two first volumes were printed in 1701, the third, under the title of a “Supplement,” in 1705, and the fourth, which is called “An Appendix,” in 1721. This was a work of great utility at the time it was published. It was the first of its kind in the English language, and many articles of biography in the Appendices may yet be consulted with advantage, as containing particulars which are not to be found elsewhere. About 1701, he published also, “An English translation of Antoninus’s Meditations, &c. to which is added, the Mythological Picture of Cebes, &c.” In the reign of queen Anne, some overtures were made to engage him to a compliance, and he was promised preferment, if he would acknowledge and submit to the government; but as he became a nonjuror upon a principle of conscience, he could not be prevailed upon to listen to any terms. Afterwards he published, in 2 vols. folio, “An Ecclesiastical History of Great Britain, chiefly of England, from the first planting of Christianity, to the end of the reign of Charles II. with a brief account of the affairs of religion in Ireland, collected from the best ancient historians, councils, and records.” The first volume, which comes down to Henry Vie was published in 1708, the second in 1714. 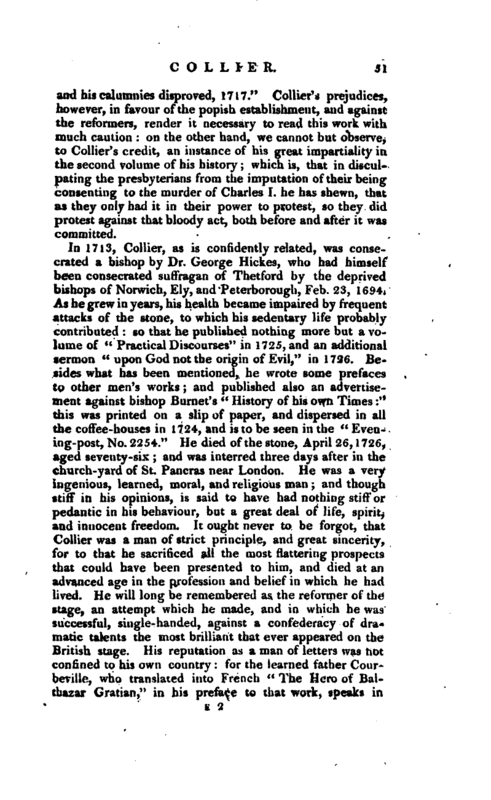 This history, which contains, besides a relation of facts, many curious discourses upon ecclesiastical and religious subjects, was censured by bishop Burnet, bishop Nicolson, and doctor Kennet, afterwards bishop of Peterborough; but was defended by Collier in two pieces. The first was entitled “An Answer to some exceptions in bishop Burnet’s third part of the History of the Reformation, &c. against Mr. Collier’s Ecclesiastical History; together with a reply to some remarks in bishop Nicolson’s English Historical Library, &c. upon the same subject, 1715;” the second, “Some Remarks on Dr. Kennet’s second and third Letters; wherein his misrepresenta-. 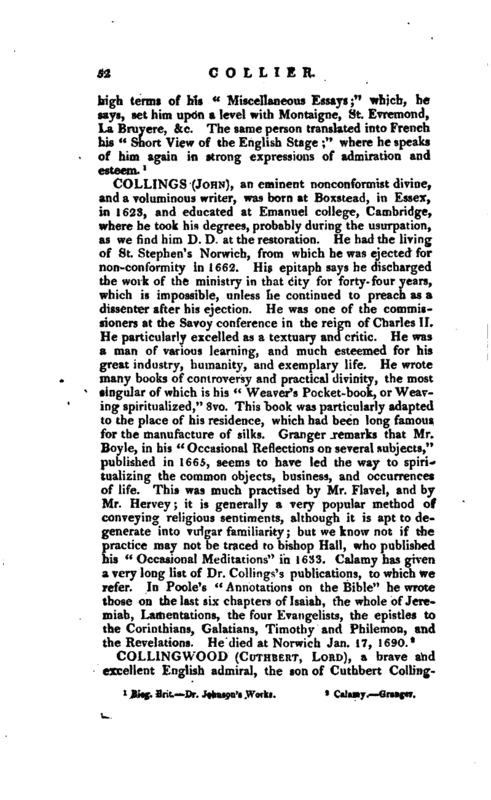 tions of Mr. Collier’s Ecclesiastical History are laid open, | and his calumnies disproved, 1717.” Collier’s prejudices, however, in favour of the popish establishment, aud against the reformers, render it necessary to read this work with much caution: on the other hand, we cannot but observe, to Collier’s credit, an instance of his great impartiality in the second volume of his history; which is, that in disculpating the presbyterians from the imputation of their being consenting to the murder of Charles I. he has shewn, that as they only had it in their power to protest, so they did protest against that bloody act, both before and after it was committed. Biog. Brit. Dr. Johnson’s Works.